Closing Date : Wednesday 10/04/2019 at 12 noon. 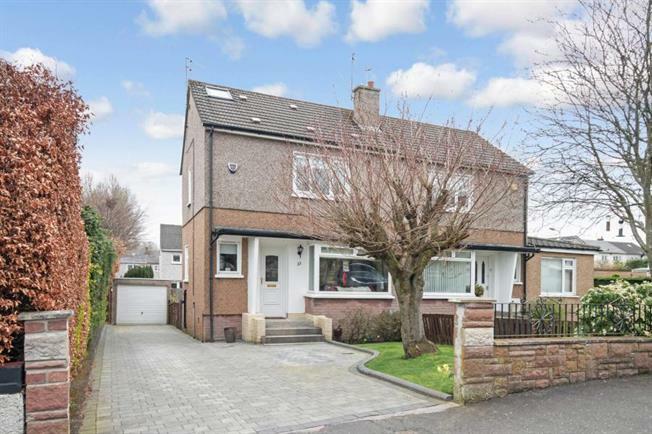 Enjoying an excellent location within this highly popular pocket of Bishopbriggs, this three bedroom semi detached villa is within the catchment area for local Schools and close to a range of local amenities, For the commuter the house has 7 minutes walk to Bishopbriggs Railway Station. This semi detached villa provides spacious accommodation set over a three storey layout, and is set within extremely good size garden grounds. The internal accommodation comprises; beautifully presented spacious lounge/diner with windows to front and rear flooding the room in natural light, well equipped modern kitchen with wall and floor mounted units and access via back door to the rear gardens. The first floor level has access to two well proportioned double bedrooms and the family bathroom with three-piece suite. The professionally converted loft space now provides bedroom number three. The specification includes gas central heating, double glazing. Outside, to both front and rear there are well presented private gardens. To the side of the property there is a garage and driveway. The property is quietly situated within a highly desirable pocket of Bishopbriggs and is conveniently located close to all local amenities including schools at both primary and secondary levels, shops, supermarket, leisure facilities, excellent public transport services including Bishopbriggs train station which offers regular links to Glasgow City Centre and the surrounding areas and a range of popular bars and restaurants. In addition to this, there are excellent road links close by giving easy access to Glasgow City Centre and the Central Belt motorway network system. EER Band D.